Arbaaz Khan from Mumbai, India is a Bollywood actor. He is the son of script writer Salim Khan and the brother of Salman Khan and Sohail Khan. He made his debut in the 1996 film Daraar. 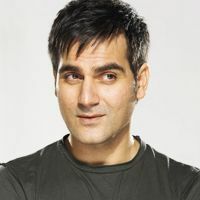 Check out the most updated and latest information about Arbaaz Khan's on the Internet.We have 48 videos of Arbaaz Khan including interviews, events, or public appearances.Arbaaz Khan has over 16 Fans registered on India-Forums.com. We have 279 Bollywood News articles related to Arbaaz Khan.Do share your criticism, comments and feedback for the Actor on Arbaaz Khan's comments page. We have over 30 Photos of Arbaaz Khan to view and download including Arbaaz Khan's Wallpapers. Hlo khan sahab no doubt ur goodness n works.u r v.gud actor producer n etc. Sir i req u pls gave a one chance of ***Sara khan***.she is v.tallentd actress. actually i m not commenting but i have an idea to share with arbaaz .after the success of dabang 2,u can go for some tie up's with tv serial producers for a show " kaun banega pyara pati " ' coz in dabang 2 we r able to see after marriage romance u can in cash it success more . in this serial call coupes on set like KBC & ask ques. from husbands about their wives. the person who will give max. correct will be the winner obviously . i have whole idea about this in my mind & if it will success , u can go for a movie based on this also . HAPPY BIRTHDAY ARBAAZ KHAN!!! HAVE GR8 DAY!!!!!!! !